If you’re planning on interior house painters and need some tips on painting kids room and your child likes dark colors and they are asking to have a dark colored room such as dark purple or something like that you can satisfy them by meeting them halfway and painting one feature wall that color. If you paint a whole room a dark color you will lose light reflection and the room will seem to be darker and also seem smaller. I also suggest that you paint with an eggshell paint because this paint will be more washable than a flat paint would be. Sometimes we paint half walls that are 3 feet from the floor up sometimes designing it as a fence look-alike or sometimes we just put graphic bars and stripes on the walls in a variety of different colors to give the room some life. Quick note, we recently repainted a bedroom where a young man grew up in. 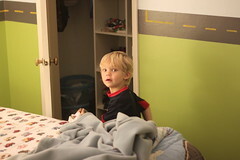 At that time he enjoyed the wall colors that he talked his parents int. The wall colors on the two opposing walls were dark blue one with a window and it. And the other two longer walls were a crimson red and the ceiling was white but with 1 million decals on it all put up with some type of self adhesive sticky goopy substance.